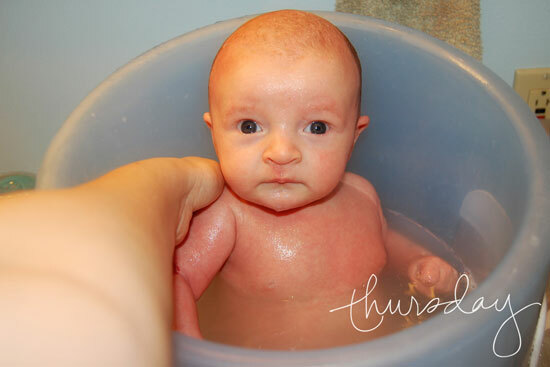 Hello and welcome to Project Life Tuesday! I am taking a photo every day in 2011 and putting them together in an album to create a unique keepsake of this year for our family. 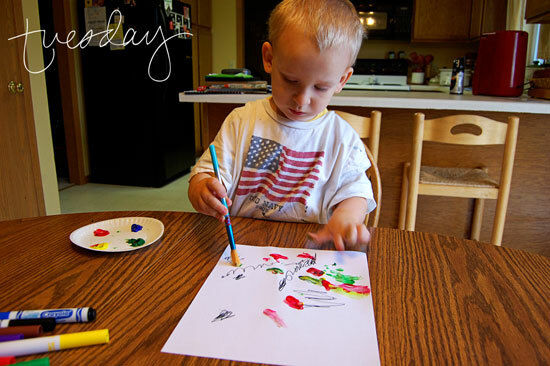 Be sure to check in on what others are doing with their projects over at The Mom Creative! 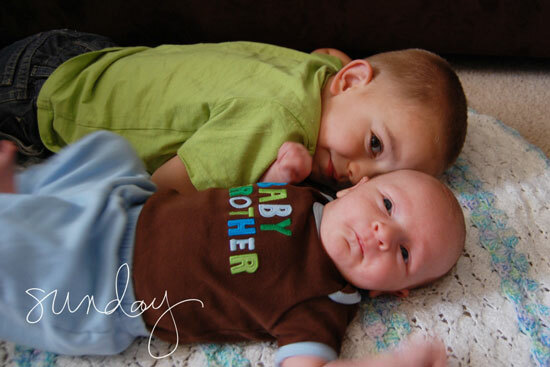 Sunday, October 9th - Isaiah just loves his baby brother. I chase him around all day long trying to keep him from pulling his fingers off or smothering him. He means well though, as we can certainly see in this look he's giving me. 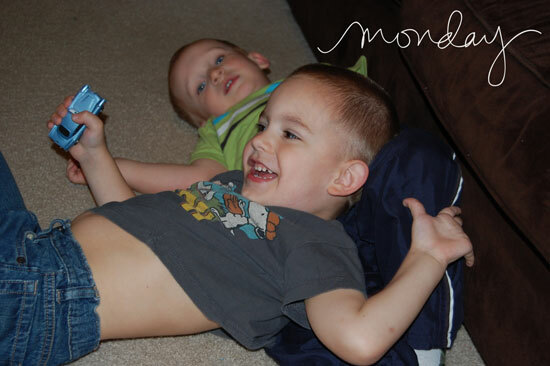 Monday, October 10th - When I'm not protecting Thomas from his big brothers, they're usually doing something like this. Micah is getting pretty good at tackling his older brother. Tuesday, October 11th - It was kind of dreary and rainy today so I busted out the art tub. My little artists painted me some lovely masterpieces, but an impromptu bath was definitely in order afterwards since Micah insisted on painting himself as well as his paper. 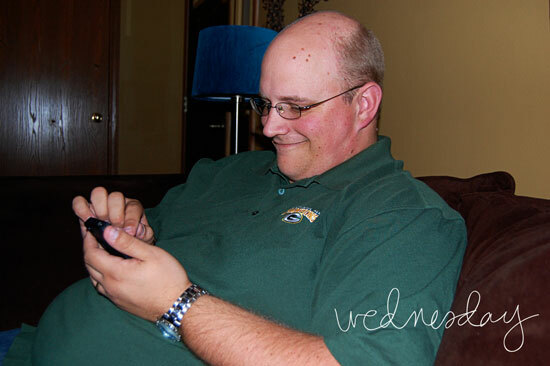 Wednesday, October 12th - Evan finally got to ditch his old phone that wored about as well as a paperweight and upgrades to an iPhone. As you can see by the smug look on his face, he's pretty psyched to have entered the world of The Smartphone. I immediately borrowed it and downloaded Instagram. Friday, October 14th - Ummm, so yeah. I think we're potty training? Out of the blue, Micah asked to go poop on the potty and he achieved success on the first try. Only time will tell if it's a fluke or if he's really ready to ditch the diapers. 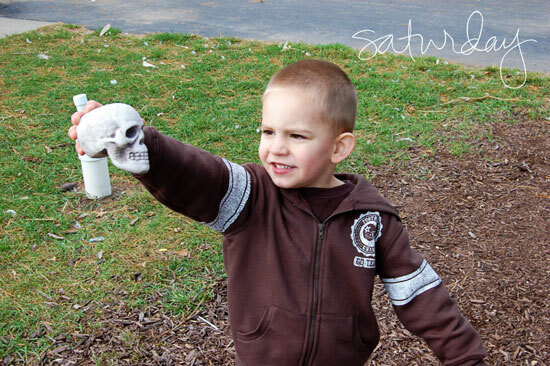 Saturday, October 15th - Isaiah found this styrofoam skull in the woodchips by the playset and became immediately attached to it for some reason. He carried it around all day, made it talk, and named it "Frank."